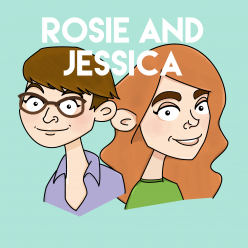 In episode 107, Rosie and Jessica are in the mood for some spring cleaning! After catching up on a puppet dog’s star turn in an opera, it’s time for some Top 5 cleaning products, complete with new feature, White Vinegar Hour. There’s mattress flipping, limescale removal and the ever present danger of rhubarb theft. Jessica picked Pretty Fly (For A White Guy) by Offspring, while Rosie went for Pynk by Janelle Monae feat. Grimes. Rosie is getting to the end of her Scylla socks. Need some spring cleaning ideas? Buzzfeed has you covered. Try Living With Lucie and her 5 Days of Spring Cleaning. That time some Chicago Sun Times journalists went undercover and opened a dive bar. You are cordially invited to a dinner party hosted by Edgar Allen Poe. The best way to deal with a break-up is definitely beating your ex at a Wizard Rock battle of the bands. Seth Meyer’s tells the story of the alarmingly quick delivery of his son.